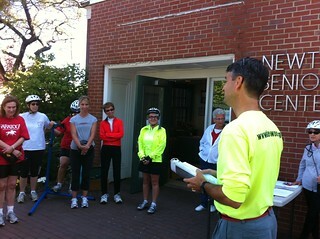 Email Steve Heinrichs, Bike Newton Safety Director, to arrange cycling safety classes. Cycling safety web tutorials provide a preview of material to be covered in Smart Cycling Classes offered to Newton cyclists. Complete the questions on Seeing Hazards and Being Visible to increase your Smart Cycling proficiency! Newton bicycling classes are offered to cyclists of all ages and ability levels with the objective of insuring safe and enjoyable riding on city streets and bike trails. Steve Heinrichs, the Bike Newton Director of Education, and a League of American Bicyclists Certified Instructor, has been offering classes for children and adults in the City of Newton since 2009. These courses are ideal for cyclists who need help building their skills before they take to the road. Exploring the “Street Smart Cycling” philosophy in web tutorial, classroom, and on-bike contexts is an ideal introduction to real world cycling for anyone interested for fun, fitness, or transportation using either a public way or dedicated bike path. Cycling has experienced a resurgence in popularity and many people are looking to cycling as the solution to concerns about rising fuel costs, environmental issues, and lack of exercise. Biking to school or work is inexpensive, active, and environmentally sustainable, but some children have never learned to ride a bike in active traffic environments and many adults haven’t dusted off their bikes in years. Street smart cycling courses are designed to meet the growing need for safe, fun, and lifelong cycling skills. For novice to intermediate cyclists who wish to experience the exhilaration of the open road by recreating or commuting by bike! This fast-paced nine-hour course (two hours in-class and seven hours on-bike) covers cycling equipment options and safety checks, cargo/clothing/route selection, and on-bike balance and awareness skills. Equips participants with a full understanding and practice of vehicular cycling and the confidence needed to ride safely and legally in traffic or on the trail. All-inclusive fee includes student manuals plus a certificate following successful completion of written and road evaluations. All fitness levels are welcome as the required two hours of pedaling time will be spread out over the course of the on-bike session and accompanied by frequent and extended rest breaks. Students provide their own bikes and helmets. 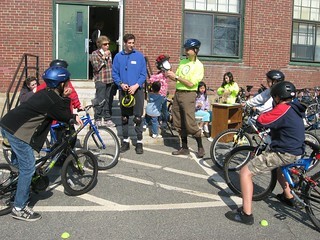 An on-bike clinic encompassing a cycling equipment, riding skills, and spatial awareness lesson plan for middle school participants in the context of an After School Program. The Smart Cycling Clinic emphasizes enjoyment of cycling achieved through practice of real-world cycling maneuvers as well as mastery of useful cycling-related knowledge. The curriculum will consist of equipment check, balance/control drills, and fun skills contests as prescribed by the League of American Bicyclists. Students provide their own bikes and helmets. Bike Newton has collaborated with Newton Middle School physical education instructors and administrators at Day Middle School to develop a bicycle safety curriculum. Currently, the Newton Schools administration is planning to adopt the curriculum at all middle schools so that all Newton students will go through a bicycling safety class based on the most up to date methods developed by the League of American Bicyclists. Have a specific question? Feel free to email Steve Heinrichs, Bike Newton’s Director of Education.